A man wrongly convicted of murdering a police officer is working with the Met this summer in an effort to cut youth crime in north London. Winston Silcott was cleared of murdering Pc Keith Blakelock during the Broadwater Farm riots in Tottenham in 1985, after new evidence came to light. He is now helping police run a youth centre on the Broadwater Farm Estate to help keep children off the streets. 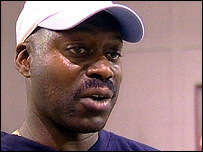 Silcott was convicted of the murder of a boxer in east London in 1984. Following a parole board decision, he was released from Blantyre House open prison in Kent after serving 17 years for stabbing 24-year-old Anthony Smith to death. He claimed he acted in self-defence after Mr Smith attacked him. Silcott also spent six years in prison for Pc Keith Blakelock's murder before successfully appealing his conviction. He said: "It's a good initiative to get the young people involved in whatever sport they desire. "There is a lot of people with talent but it's just that there is nowhere for them to go to show their talent." Pc Tim Allpress, who also works on the project, said crime in the area had fallen as a result of the project. "The whole point... is to give the youth on the estate direction and an opportunity to get themselves off the street and to participate in sporting activities," he said. "We have analysed the crime statistics as we have gone along and there has definitely been a downturn." For organisers, the initiative has proved a success not only for the police, but a personal one for Silcott. Paul Dennehy, Broadwater Farm Estate manager, said: "It's 20 years on - everyone has moved on. Winston's come through some challenges. "He's now looking to put something into the community and he's doing a fantastic job." Sporting activities are held until midnight during the school holidays.